Our Reykjavik walking tour is your introduction to our country. It will help you get your bearings and make the most of your stay in Iceland. We recommend it as your first stop in Reykjavik (well, maybe check into your accommodation and drop your bags off first). Our family-friendly tour brings the history of Iceland to life with exciting stories and Icelandic mythology. 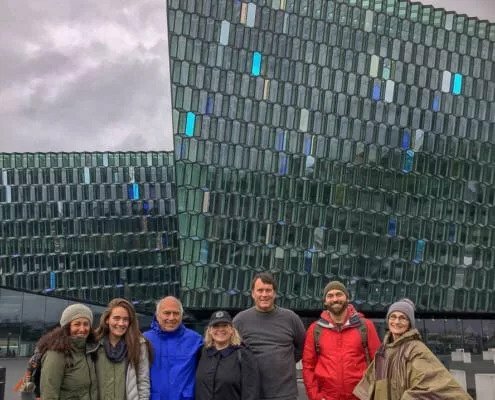 We’ll visit all of the famous landmarks in the city center, such as Harpa Concert Hall, Reykjavik Harbour, Hallgrímskirkja Church (we’ll teach you how to pronounce that), Reykjavik Pond and the Parliament building. But, we’ll also share hidden, local spots with you; things you’d miss if you didn’t know what to look for. We want you to feel the unique, friendly atmosphere of our quirky little city, not just to see the most popular tourist attractions. We’ll even have a small lesson on the Icelandic language so you can not only walk with a Viking but talk like one too. We’ll be the Chandler to your Joey, and Rachel to your Monica; showing you our favorite places to eat, drink and visit (we also have an intimate knowledge of happy hour deals that we’re happy to share). 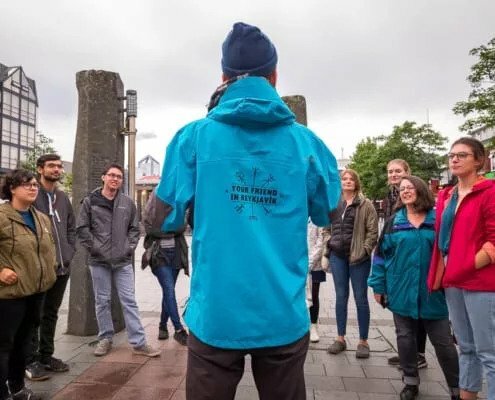 The Reykjavik walking tour lasts approximately two hours, and we’ll walk around 3-4 km, meaning you’ll have earned a tasty Icelandic beer afterward. We never have more than 12 of our new friends on tour, meaning we can answer all of your questions and get to know each other a bit. 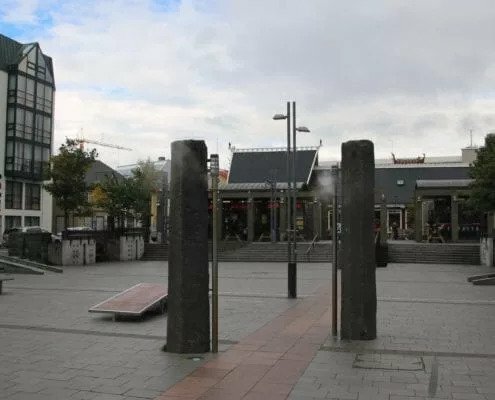 Our starting point is at Ingólfstorg (Ingolfs Public Square) by Aðalstræti (Mainstreet) in the center of Reykjavík. You'll find us by the two stone pillars in the photo above!